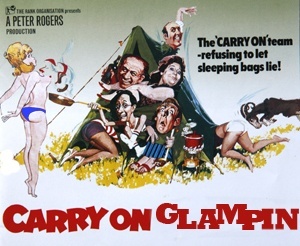 What A Carry On! More Camping Giveaways! A pack of Inspired Camping mantra postcards and window sticker. 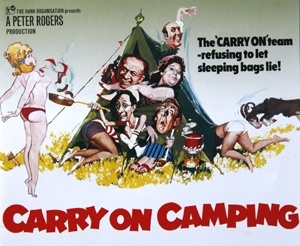 Simply leave the number of differences you can spot between the two cheeky images below from the extremely silly Carry On Camping film, and leave your answer (we only need the number of differences you can spot) in the comments section below. The winners will be selected at random from the correct answers given on Friday 5 October and winners will be emailed no later than Tuesday 9 October. Don’t forget to sign up for our free updates and bonuses if you want to be one of the first to hear about our future competitions. It’s free, you can unsubscribe at any time and it will give you access to our regular articles and camping giveaways. Also, for daily updates and to see some of what goes on behind the scenes at Inspired Camping, click ‘Like’ on our Facebook page. Plus, for daily ramblings, inspirations and cool camping and glamping chat, follow Sarah on Twitter. Telsa’s Tiny House Off-Grid Technology: Is This The Future Of Glamping In 2019? Staycations At A Seven Year High – Is Glamping The Reason?